Find us Saturdays at Winter Farmers Markets! "Always the best, in local fresh." 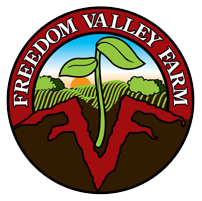 Freedom Valley Farm is a grower of fine, naturally cultivated vegetables, fruits and other produce. Our customers are families, individuals, restaurants, grocery outlets, and farmers markets.